Online Ordering System – Now LIVE! To our ever valued customers, we are thrilled to announce that we have officially LAUNCHED our Online Ordering System. 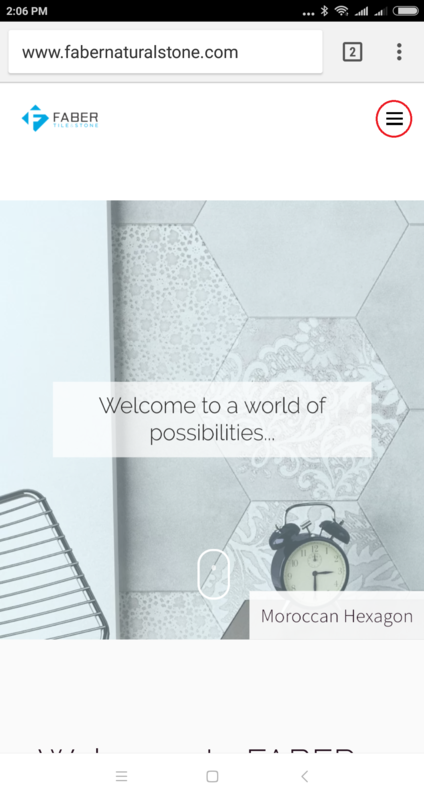 We welcome you to visit store.fabertile.ca and Register for an account. 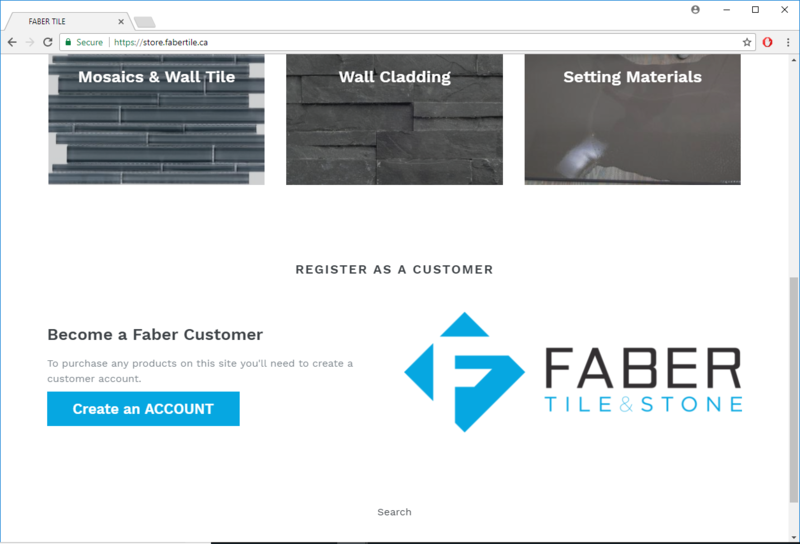 Once your account has been processed by the FABER Tile + Stone team you can transmit your orders to our Order Desk using this new ordering system. We will continue taking orders via the traditional methods (email and fax) in addition to accepting orders transmitted using our new Online Ordering System up to April 30, 2018. 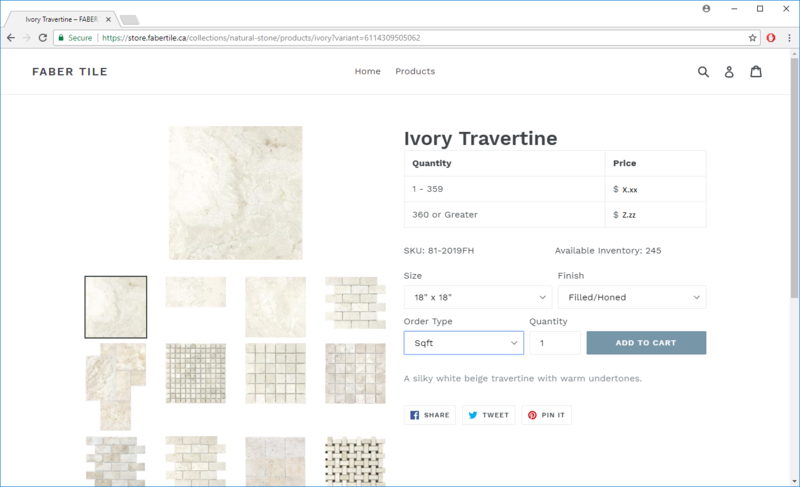 Commencing May 1, 2018 FABER Tile + Stone will accept orders placed only on our Online Ordering System. We encourage our customers to please use this time to become familiar with transmitting orders to us using our Online Ordering System. There are two ways to go to the FABER Online Ordering System ("FOOS Portal"). 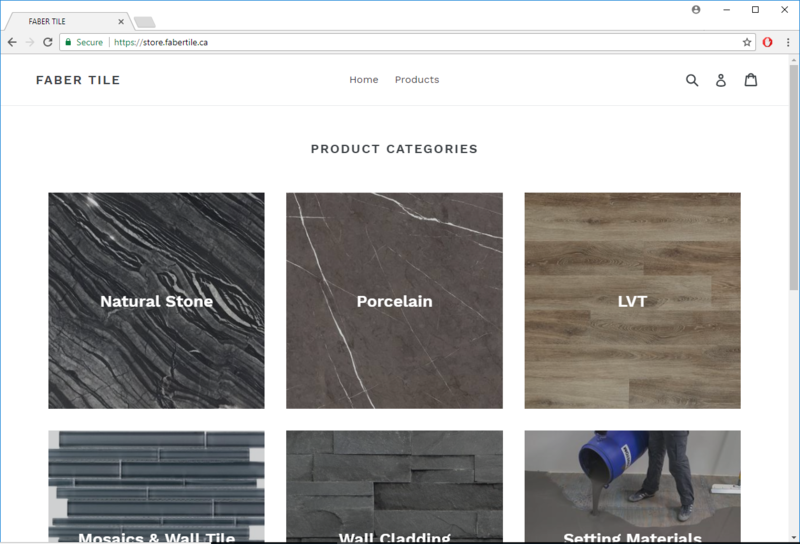 You can visit our website www.fabertile.ca and the upper right hand corner of your screen you will see a link that says LOGIN TO ORDER. 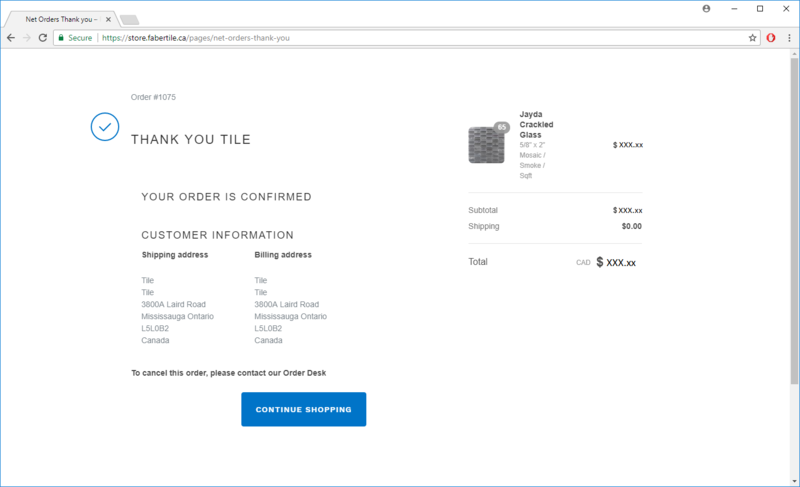 Alternatively, in any web browser type into the address bar store.fabertile.ca to be taken to the FOOS Portal Home page. At this point you can view our various products by clicking into one the PRODUCT CATEGORIES shown on the home screen. 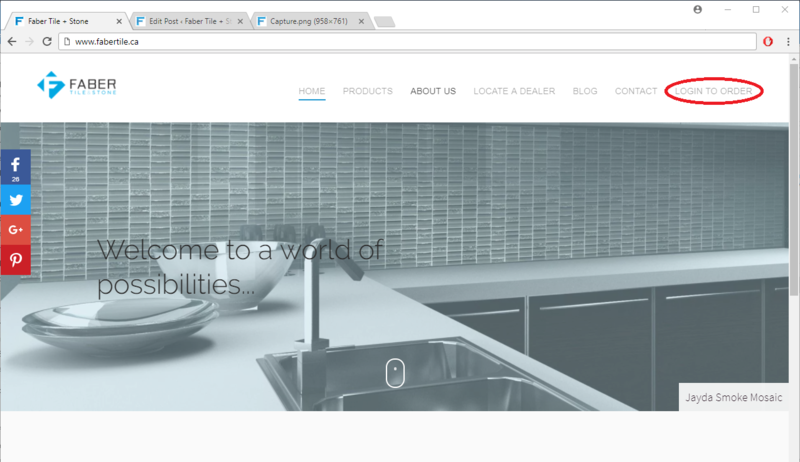 When viewing a product, you will be able to see available inventory, product descriptions, available sizes, formats and finishes, and FABER item numbers. In order to see product prices and place orders for any product, you will need to Register as a Customer. To do so, scroll to the bottom of the Home page and click the Create an ACCOUNT button as shown below. 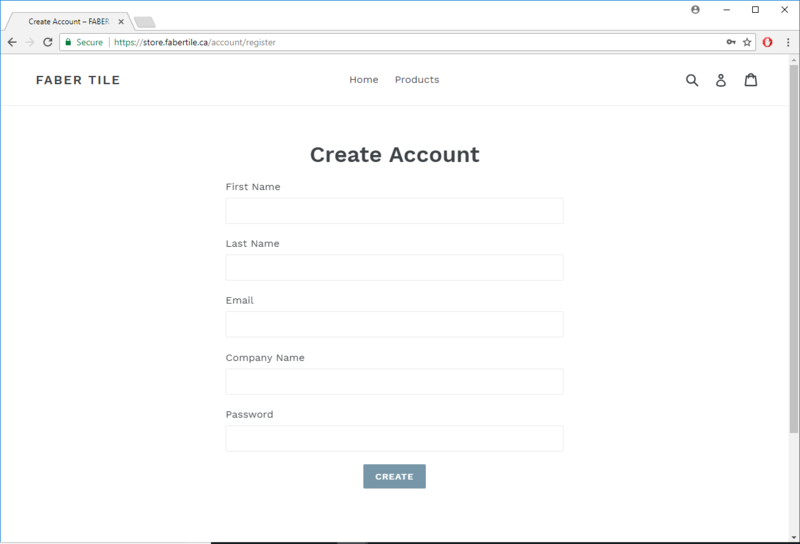 Next, you will need to enter your Name, Company Name, email address, and create a unique login password to create an account. Once you have completed the form and clicked the CREATE button, we will receive notification that you have Registered as a Customer. Once we receive notification of your registration, we will verify the information submitted and activate your account. 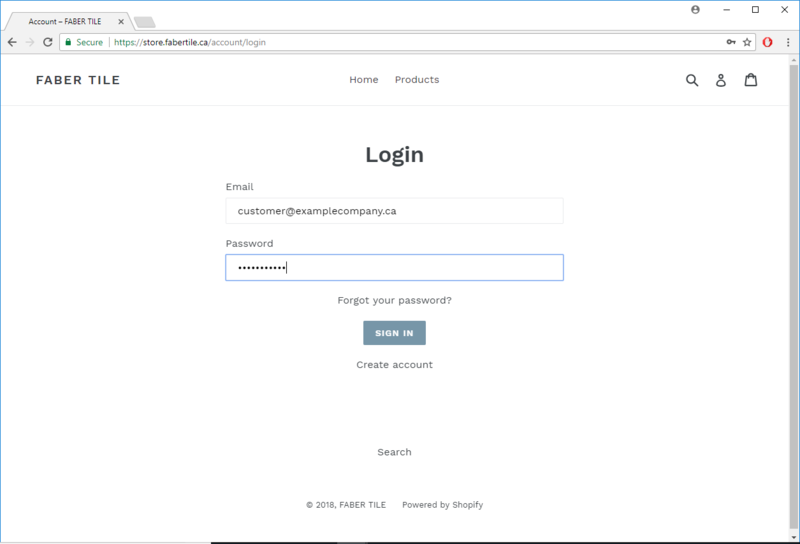 After you have registered as a customer, you will be able to log into the My Account page of the FOOS Portal and update your address information. To go into the My Account page, click on the Generic Avatar icon towards the top-right of your screen. 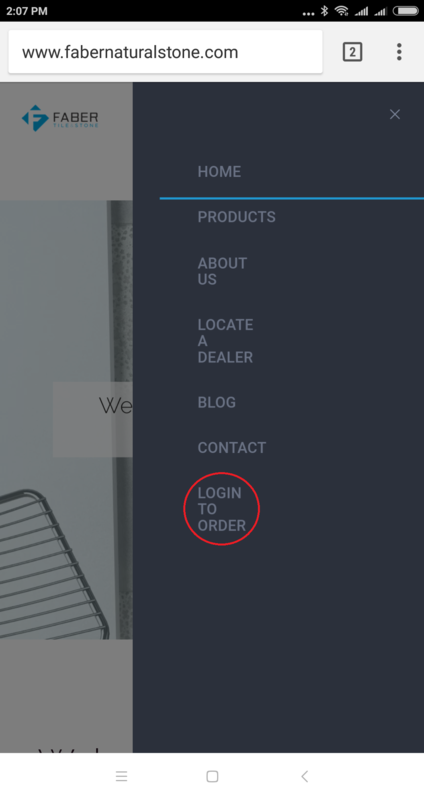 In the My Account page you can check on your recent ORDER HISTORY, update your address or add other Ship-To locations under ACCOUNT DETAILS by clicking on the VIEW ADDRESSES button below your primary shipping address. Finally, you can make a payment against your account using the ACCOUNT PAYMENT field by entering the amount you want to apply to your account, and clicking the MAKE ACCOUNT PAYMENT button. Once a FABER associate has had a chance to review and approve your account, you will need to log out and then log back in using your newly created account credentials. Log out by clicking Log Out. To log back in, click the Generic Avatar icon to be directed to the login page. Enter your credentials to log in. Once logged in, you can search for products directly from the Home page by clicking into one of the PRODUCT CATEGORIES shown there. Alternatively, you can Search for any item by clicking the Magnifying Glass Icon at the top right of the page. 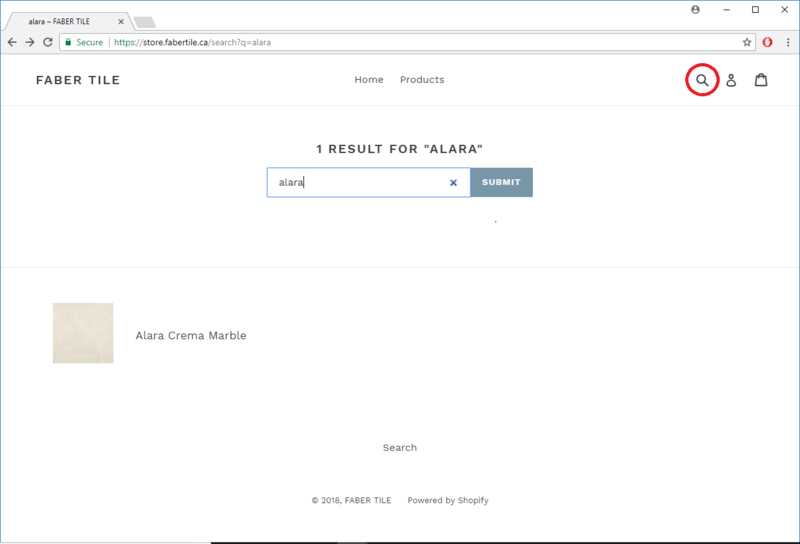 Enter any search term to find the product you wish to order. To view all of our products, click on the Products link at the top of any screen. Here, you can browse all of our products. By using the Sort drop-down at the right of the screen, you can sort the products alphabetically, by price, by best seller, etcetera. 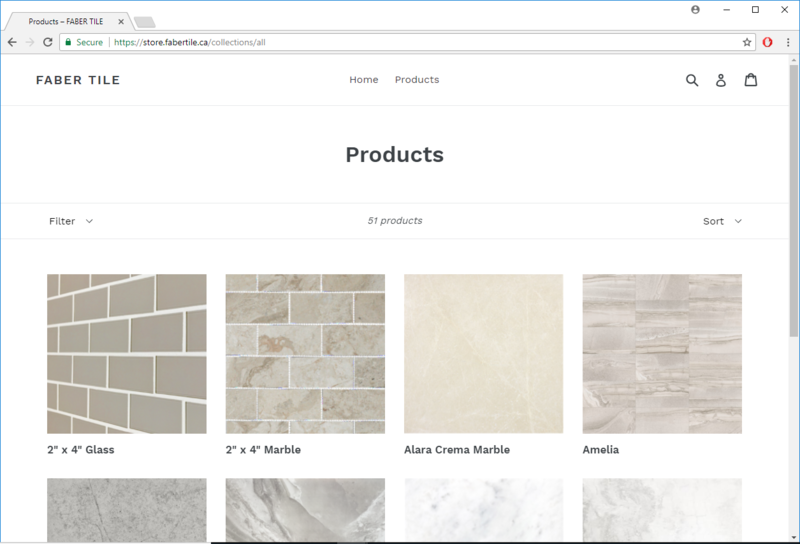 By using the Filter drop-down at the left of the screen, you can sort products based on key attributes like glass, marble, mosaic, grout, etc. Once you have found the product series you wish to order from, click the product image and you will be taken to the Product page for that series. Once you are in the Product page, you will see all available items for that series. 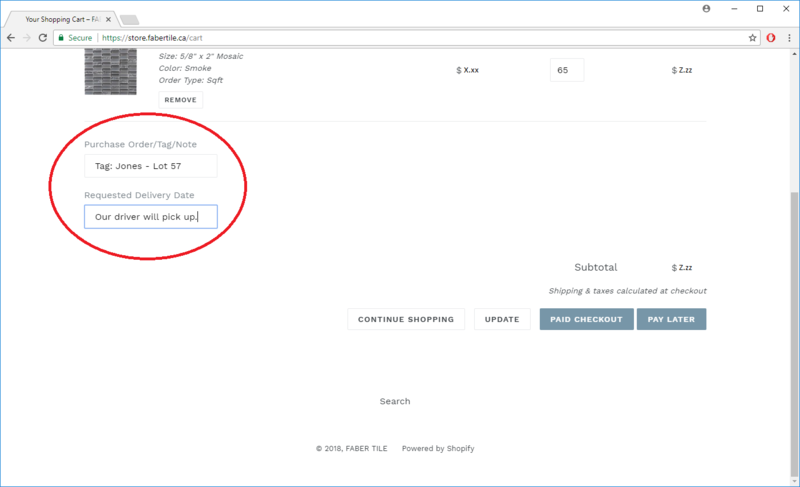 Set the various variables for the product you are ordering (Size, Finish, etc), and you will see that items Price (including volume discount price), Available Inventory, and FABER SKU number. Next, you can enter the desired quantity, and click ADD TO CART to place your order. 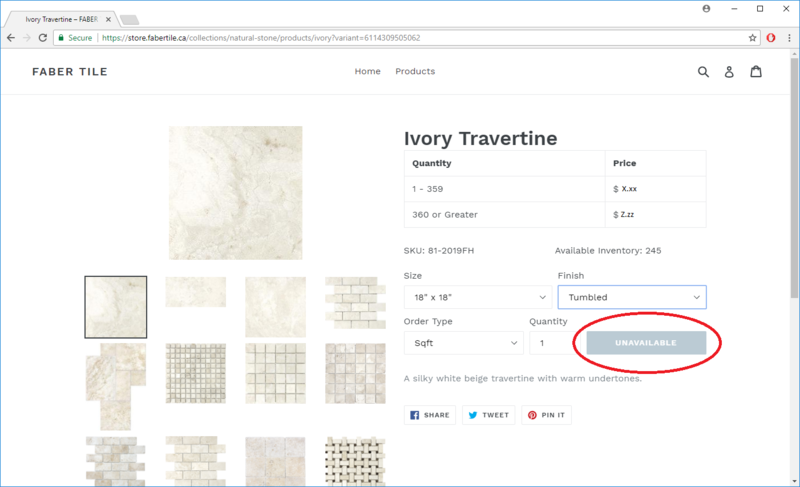 If you try to order an item by using the wrong or unavailable variables for that product, you will not be able to add it to your cart until the correct variables are used. Once you are finished adding items to your cart, you are ready to check out. 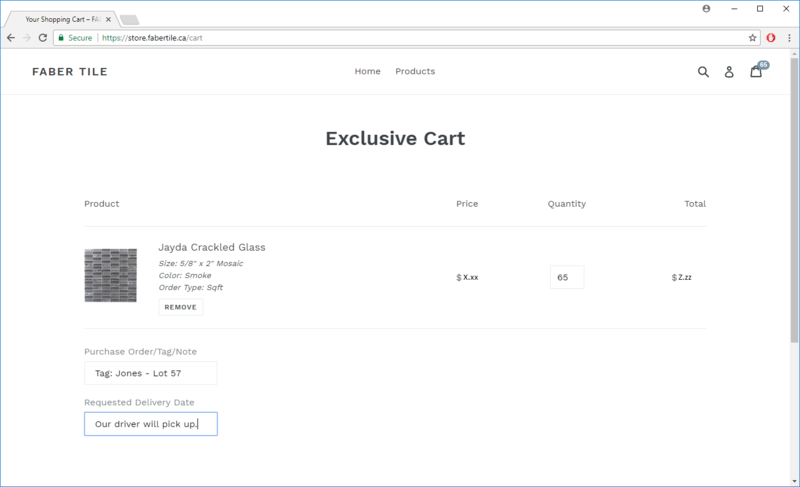 At the checkout page, you will be able to verify your order before submitting. Here, you will also be able to enter a Purchase Order/Tag/Note or any other message for our order desk, as well as a Requested Delivery Date (if different than your next regularly scheduled delivery date). 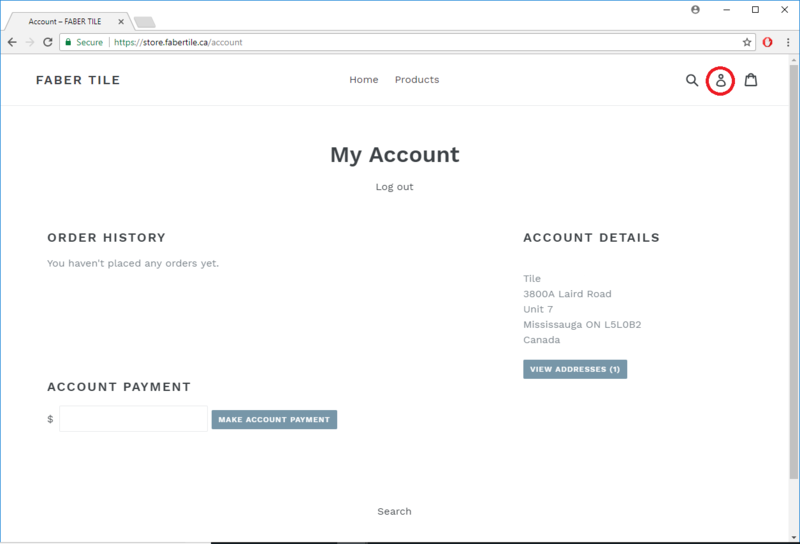 Once you are ready to submit your order, our Customers with a Payment Terms Account will have the option to make payment at checkout by clicking the PAID CHECKOUT button, or put the order on their Account by clicking the PAY LATER button. Please note, COD Customers will not have access to the PAY LATER option. Upon submitting your order, you will be taken to the CONFIRMATION page. If you need to make any modifications or to cancel your order, please call our order desk at (905) 849-9229. You will also receive an email of this confirmation at the address used to register your account. On a Smartphone, your screen will look different than what's shown above, but the interface will work the same. To access the FOOS portal, go to www.fabertile.ca tap the 3 bar Menu Icon at the top right of your screen. Then, tap the LOGIN TO ORDER menu item from the right-side pop-out. Should you have any questions regarding how to use this ordering system, please reach out to your FABER Sales Representative or call our Order Desk at (905) 849-9229.